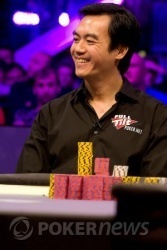 Congratulations to John Juanda, the 2008 WSOP-E Main Event Champion! 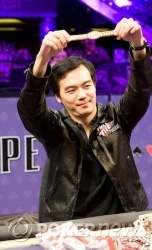 Even after a grueling 22 hour final table, John Juanda could not wipe the smile off his face as he held his fourth WSOP bracelet aloft and posed for the throng of waiting photographers. Cool and implacable, Juanda never lost his focus, went on tilt, or lost his temper on his way to victory tonight. Kudos are also due for our runner-up, Stanislav Alekhin, who gave Juanda a true run for his money. Juanda admitted in his post-game interview that he found his opponent nearly impossible to read and has great respect for his game. Alekhin is surely a talent to watch on the circuit in the months and years to come. For those of you who stuck with us throughout our 22 hours of final table coverage... well, you're all insane! Dedicated, but insane. It's been an exciting two weeks of poker here at the Empire for the 2nd annual World Series of Poker-Europe, truly a global event, with two Danes, an Afghan and and Indonesian-born American taking home the gold. Thanks for tuning in and from London's Empire Casino we bid you good night... er... rather, good morning, and good luck! Moments after his epic victory, John Juanda walked over and gave a hug to Masa Kagawa, one of the players who railbirded him all night and all morning long. Roland de Wolfe is here as well. He played in the PokerStars.com EPT London last night across town at the Vic. De Wolfe went to bed, woke up, and arrived in time at the Empire Casino to see Juanda take it down. Juanda began the day as the chipleader. He slipped below 1 million in chips several times, but managed to gut out the win. "This is the longest final table that I have ever played," said Juanda in a post-victory interview. When asked about his opponent, Stanislav Alekhin, Juanda remarked, "He had me down a couple of times. I was pretty sure and confident that I was going to win. I didn't give up. I have to give the last two players a lot of credit." When Juanda started out playing professional poker, he picked up several bracelets and held the most out of his core group of friends that included Daniel Negreanu, Phil Ivey, and Allen Cunningham. "It's so long ago when I won my last bracelet, I can't remember. It's embarrassing. Some people have to keep up with the Joneses. I have to keep up with the Iveys and Cunninghams and Negreanus," he joked. "I wondered if I will ever win again. Today there are so many young excellent tournament players from all over the world. Like the two young Russians and the Scandis. Much more than it used to be. Daniel Negreanu said that we have to step up our game." Stanislav Alekhin has the button. He moves all in and Juanda calls. The flop is and Juanda flops trips to his and the audience's elation. The turn is the and Alekhin is drawing dead. To put the icing on the cake, the falls on the river for quads and John Juanda is our champion, winning the 2008 WSOP-E Main Event and his fourth World Series of Poker bracelet! Stanislav Alekhin made a tremendous effort tonight and takes home £533,950 for his runner-up finish. Juanda has the button. 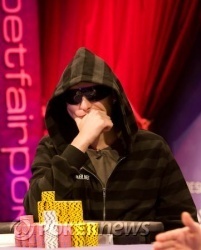 He raises and Stanislav Alekhin folds. Stanislav Alekhin has the button. He gives Juanda a walk. John Juanda has the button and he folds. Stanislav Alekhin gets a walk. Stanislav Alekhin has the button. He open-shoves, but Juanda can't pull the trigger. He folds, and Alekhin wins the pot. John Juanda has the button. Juanda raises to 165,000. Stanislav Alekhin calls. The flop is . Stanislav Alekhin fires out 325,000. Juanda peeks at his cards and blinks methodically. He moves all in and Stanislav Alekhin insta-calls. Juanda is ahead with top pair against Alekhin's flush draw. The turn is the . The river is the . Juanda wins the pot and doubles up. The smattering of Juanda fans jumped to their feet and gave a hearty golf clap. Stanislav Alekhin stack was decimated. He was left with about 600,000. Juanda increased his stack to 6.6 million. Stanislav Alekhin has the button. He gives Juanda another walk.